Most parents at least once in life have to answer this question their curious little ones toss at them: ‘Where did I come from?’ The child is too young to understand the complex biological activity that brought the child to this world. Embarrassed and bashful, parents resort to explanations that they might have got from their own parents. A white stork that flew over their roof carrying a little cute baby in a sling hanging from its long beak dropped it through the chimney! They found the cute little baby by the fire-side in the morning! The children are usually happy with that explanation and may watch for storks flying across their rooftops with babies in slings hanging from their long beaks, until they grow up to find out the truth for themselves. The storks don’t carry babies in their beaks nor deliver them to couples longing for children. It is all part of myths that grew around storks—majestic, beautiful birds commonly imagined in white colour. For reasons we may not fully know they became symbols of kindness, love and care. 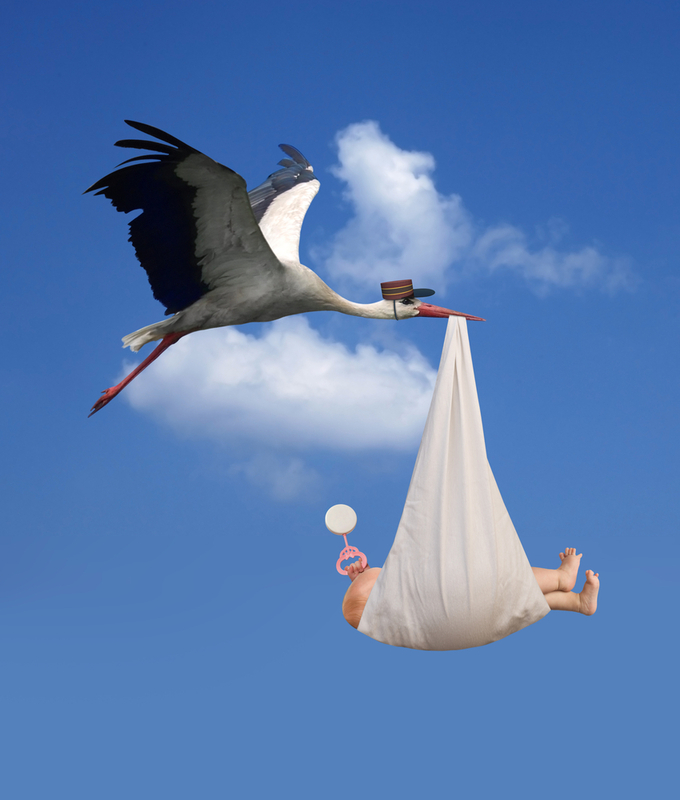 Such myths about storks abounded in the ancient cultures of Egypt and Mesopotamia. Many European cultures have stories of caring and faithful storks. Storks are considered monogamous and faithful to their partners. However, it remains a myth since scientists have found that they change their partners after the young one are hatched and even during their migration. People believed unlike other birds storks are birds of integrity since the return to their same old huge nests year after year for laying eggs and hatching. According to some myths storks would prefer to be burned to death along with their helpless young ones if their nests catch fire than fly away to safety. Popular beliefs and myths shape our language. That is true of Hebrew also. The Hebrew language gave the right word for this birds which had become symbols of integrity, faithfulness and kindness. Though according to Mosaic law this bird is considered unclean, the bird is called HASIDA which is translated as ‘faithful’ or ‘kind.’ The word comes from the root HSD and the corresponding noun HESED. Though the root HSD is very frequent in the Old Testament, there is no consensus about how the word HESED should be translated in to English. Translations vary and even within a given version it could be translated variously depending on the context. HESED is a unique concept so rich in meaning which makes any language inadequate to express it. So, we have words like as ‘faithfulness’, ‘steadfast love’, ‘mercy’, ‘grace’, ‘loyalty’, and so on. HESED is freely given and freely received; it is undeserved. It is not an obligation but sometimes comes to us as a surprise. The people of Jabesh were extremely kind to Saul who died in the battle (2 Sam 2:5). They kept his body so that it will not fall into the victorious Philistines to humiliate him further but he will receive a royal funeral fitting his role as a king. What they rendered to the defeated king is HESED which is rendered inadequately as ‘loyalty’ (ESV, NRSV), ‘kindness’ (JPS, NIV). He didn’t deserve it nor the people of Jabesh were obliged to render it to him. It was a free act of ‘kindness.’ The servant of Abraham who journeyed to the distant land where Abraham’s kindred lived appealed for HESED from Laban (Gen 24:49). Laban was not in anyway bound to comply with that request. But still, sending his sister with a stranger to be married to a relative whom he hasn’t met was an act of HESED. It was an act of trust and kindness. Ruth also extended HESED to her old and helpless mother-in-law by following her to a uncertain future. She could have opted to leave her as her co-sister Orpah did. Boaz called her action an act of HESED (Ruth 3:10). There were times when Israel failed their God—they were not loyal to the covenant. Sometimes, kings like David or less prominent individuals have failed to meet the demands of God. However, they appeal to God for HESED solely on the basis of God’s faithfulness to his relationship with his people. David would cry, ‘Have mercy on me, O God, according to your HESED...’ (Ps 51:1). Though the humans break the relationship, God always remained faithful. God honours his part of relationship though the corrupt humanity couldn’t keep their part. That makes saint Paul say, ‘if we are faithless, he remains faithful’ (2 Tim 2:13). The HESED thus becomes God’s ‘unfailing love’, or ‘steadfast love’ which the hymn writer (Albert Lister Peace, 1844-1912) would call ‘love that wilt not let me go...’ The history of Israel is a history of Gods’ unfailing kindness to them. No words are adequate to express it because we those who follow Christ experience it as the, ‘deep, deep love of Jesus, vast, unmeasured, boundless, free’ as the hymn by Samuel Trevor Francis (1834-1925) goes.